Very pretty and good quality for what you pay. Glimmering effulgence gets a stunning showcase in this resplendent white sapphire ring. The glamorous sparkle of the sapphire is struck against 10-karat white gold for a heavenly look befitting of any proposal. My fiance & I bought the 10k White Gold Created White Sapphire Solitaire Ring with 2ct stone to use as an engagement and wedding ring and we love it! I wanted something that looked like a diamond, but also did not want a conflict diamond...so, I got the next best thing! This stone looks, feels, and reflect light just like a diamond. I highly recommend it! So...I was expecting this ring to be just OK since some reviews said it wasn't great. I've been married almost 10 years and my original e ring was just too tight and after having it resized 4 times, I figured it was time for an upgrade. Hubby and I talked about getting a bigger diamond when our 10 years approaches in September but I thought I would get this for now. 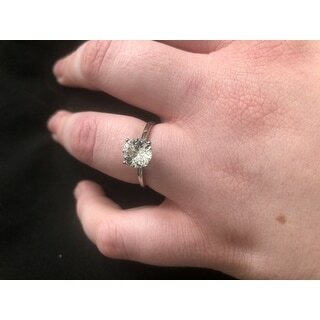 I've always wanted a simple, solitaire in a larger stone and of course could never afford it (and even though we could do a payment plan for our upcoming anniversary, I"m thinking why would I when I found this great ring). While this white sapphire doesn't look exactly like a diamond, and nor is it meant to, it is beautiful! And, it does the job...I get a white stone that is big and beautiful, no one would question if I'm married or not, and it has meaning). It has an antique look to it and I just love it! Plus, it's the birthstone of September, the month we got married. I just love it and am so happy with this purchase! The shank/band also feels solid and not too thin. Thanks so much Overstock! I've ordered other products/rings before and this has been the best purchase so far! I purchased this as a back up for when my engagement ring is in the shop (my engagement ring has a high setting and frequents the shop often). This ring looks great even when on another finger. I had looked at other rings on Overstock that were cheaper, but decided to go with white gold and to keep the cost down a man made stone. However, it is hard to tell the difference between the real deal and this created sapphire. I have received many complements on it, and some people even think it is a real diamond. It has held up well and I plan to wear it even when my engagement ring is on my left hand. It is also my back up in case I am traveling and want to leave my diamond at home. It's a great ring and an even better price. Beautiful purchase. Match many outfit with Miadora 10k Gold Created White Sapphire Stud Earrings. Look very stylish. Stay on the right spot. Easy to put on or out. I just love the sparkle and get loads of compliments - buy them, you won't be sorry! I ordered this as a gift for my niece. She loved it! The white sapphire color is very rich and the ring all in all looks very elegant and classy. Well worth the price. No need to be extremely scared wearing it in case of losing it. But yet looks really rich and basically looks more $ than what i paid for. I would recommend this ring to anyone. Wow wow... The product is exactly as shown...it does fit larger then usual... So if u r thinking of getting it, make sure u listen to these reviews... I wear 6.5 regulary...should have gotten 6 or even 5.5. Amazing delivery, precise!! They had it tracked down to days...after 9 days, when I emailed asking for mailing status...they knew exactly where it was and when was it to be delivered...and it sure got delivered as they said. I was impressed. I will definitely buy from Here again. I am so excited to get wear my ring. I wear it between my diamond band and solid band. This ring is just everything I hoped it would be. I can't stop looking at it! Hee! Hee! ;-) The price was very reasonable. My son was born in September and so I got this white saphire. I love Overstock because all the products are shipped promptly and the items have arrived intact. I am very pleased! I ordered this ring because I had two gold diamond bands . I was afraid it would not look right but I was wrong. This ring is just beautiful with these bands. I would recommend this ring. I have used this company before and have never been disappointed can’t wait to get the gold band to wear with this ring . I brought this ring for my fiance and she loves it alot. It shines and looks beautiful. I you are on the fence about buying this ring I would say go for it it is awesome. The Ring was exactly as described, except it was more beautiful in person than in the pictures. It was well made and the stone clarity was outstanding and a true tribute to the manufacture. I would recommend this ring to everyone. I would also say all the purchases I have made from Overstock.Com has been just the same, outstanding price and value. I give them my highest recommendation. The white topaz is extremely clear and bright. The ring looks amazing. Given I'm extremely picky when it comes to jewelry, you can be assured that I have inspected this item closely. The ring is beautiful! Looks like a real diamond (has a very nice sparkle to it). I loved it so much, I ordered another one to have as a back up. The shipping was faster than promised. Overstock.com is simply great! I love this ring and the price. You can’t even tell the difference in a real diamond ring. I have received so many compliments. I brought a anniversary ring that I added to this ring. What a beauty!!! One happy customer!! My wife picked this one out. 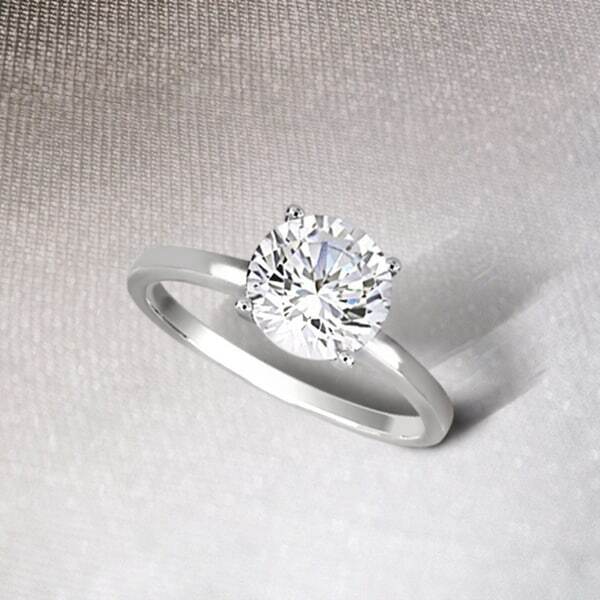 She always loved the solitaire look but didn't want to spend thousands on a diamond. 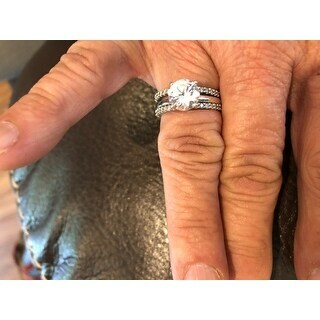 We got it cleaned at a local jewelry store and it looked magnificent. She cleans it every week with soap and a toothbrush. For those who desire a beautiful and elegant ring with just the right sparkle and fire, this is the right size for a day to day sapphire ring. It came carefully packed in a nice box, too. I got it hoping to match it with my stud earrings. After much thought, I decided on an upgrade that was more brilliant than a sapphire. Thank you . Shiny nice clear stone. I ordered wrong size so I exchanged and had no problems. Sleek looks like real diamond. Bought this for my girlfriend for Christmas and she loves it , tons of compliments each time she has it on . Nice ring at a good price ....great value! 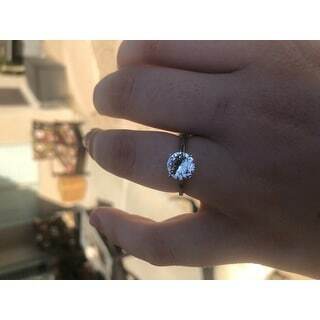 Really nice ring and stone. 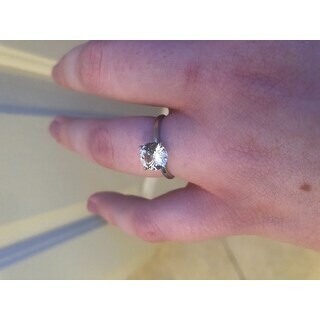 Nice ring, big stone, though not as sparkly as I imagined it would be. I really like this ring. The stone is pretty and clear and has kept its shine. I do not wear it in the shower but I do wash my hands a lot with it on and still looks nice. "How high is the band? Wondering the dimension of the band"
"could this be reset with a diamond? how large of a diamond, in mm?" Yes because it is 10 k gold. A diamond to fit it would be slightly larger a diamond is slightly larger than a sapphire of the same carat. "Does this lab-created sapphire have the same chemical properties as a natural sapphire, or is it a lab-created sapphire simulant? Thanks." Stones created in a lab are chemically, physically and optically identical to those mined underground — but they have fewer flaws, a lighter carbon footprint, and cost less too. "is this real solid 10k white gold gold or is it plated?" I believe that it is solid. "Does this ring have a matching band option?" "if the sapphire were a diamond what Cwt would it be equal to?" "Is the stone cubic zirconium or really created white sapphire "
This is a Created White Sapphire.